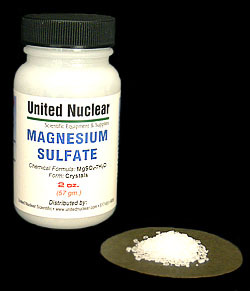 Magnesium Sulfate has been used medicinally since the 1600s and probably long before to heal scratches and rashes. Its also used as a laxative, to treat migraine headaches, and in the treatment of tetanus. In organic chemistry, Magnesium Sulfate is commonly used as a desiccant in organic synthesis due to its affinity for water. Added to a solution of Sodium Silicate, Ferric Chloride crystals will 'grow' and make white crystals in the well-known 'Chemical Garden' experiment.